By Susan RobertsI’ve been in my new abode for seven weeks now, and feel quite settled despite not having unpacked much. The problem is that in about another seven weeks’ time I will have to re-pack the few boxes I have opened and go through the trauma of moving back down to my newly-refurbished cottage at the bottom of the garden. List the pros and cons, my mother would say. So far they are about equal. The huge, rambling and once impersonal place that I have now spread myself into is not the soulless barn that I told everyone it was. The pleasure of being able to arrange my things into different rooms, have a view on all four sides, enjoy something akin to mountain air blowing through my windows, have space between my pieces of furniture in each room, and to be able to reach my sewing cabinet when I need to mend something or alter a curtain quickly – all that is something I hadn’t bargained on enjoying so much. Let’s face it – I love it here. But I love my cottage too, remember? Everything is cute and quaint and within reach there, whereas up here I am going through shoe leather just tramping through the place. Those midnight snacks I enjoyed when the kitchen used to be next door to the bedroom have to be planned now – I actually have to walk down a passage, through a dining room and past a spare bedroom to get to the kitchen! I need a bigger snack by then after that kind of exercise. And then there’s the question of neighbours. As far back as I can remember, I have enjoyed being on my own. Solitude across the garden means I can play my music at 11 pm when I get home from work, or even watch a DVD until two in the morning. At the moment I can’t do that. I tiptoe around when I arrive home, very aware that my landlord – who is a light sleeper – has his bedroom beneath my kitchen. Late night feasts and scraping of chairs on the floor are not exactly fair to him. But then, early morning music from him and his housemate as they chat over breakfast in their kitchen drifts up the blocked-but-not-completely-sealed staircase to my dining room. If I am sitting at my table writing, the Country & Western vocals filtering into my brain tend to interfere with the thought processes of my novel’s characters, who don’t want Lucille back, nor would they be cruel enough to name their boy Sue. On the other hand, there is a very real danger in this beautiful but sad country that a woman living on her own is just no longer safe. I do feel more secure knowing that my two male neighbours are just a shout away on the other side of a wooden board. If anything happened to me down in the cottage, who would know? I live in Bridget Jones-like fear of being the old lady who dies alone and no one misses her until the local rodents have had a good feast and the smell of decomposition eventually reaches the nostrils of the neighbours. I suppose the real question is: can I afford to stay here? Probably not. The rental is bound to be at least twice what I pay downstairs, but I haven’t yet had the guts to ask. And the perverse part of me doesn’t want to ask just yet, because I know that the answer will crush all my fantasies, and at the moment I am happier living up here in Cloudcuckooland, not knowing. My cats love it here, of course. They have room to spread out and have settled very well. It hardly seems fair of me to expect them to move again, does it? While they get to savour it all day and every day, I work a six-day w eek and feel as if I haven’t yet had the chance to fully enjoy the place. It’s like I’ve only just moved in, and I’m not yet ready to move out. I haven’t even started going through all my junk, which was part of my plan before squashing myself back into the cottage. And then there’s the bath. For the last fifteen years I have been a shower-and-go person, having lived in tiny cottages where showering is the only option. 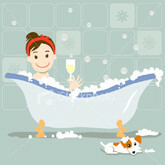 Now I have a bath as well, and the late night indulgence of a foam bath once or twice a week while drinking a glass of wine and listening to classical music is one that has brought back memories of a long-forgotten youth. I’ve also just bought a huge bottle of magnolia-scented bath crème and it would be a sin to waste it.